As part of our involvement in the exhibition we were asked to organise multiple collections from across the UK, stretching as far as the Orkney Islands. This also included liaising with couriers from lending institutions such as the Edinburgh National and the Tate. Mtec were also tasked with the collection and installation of Hepworth’s ‘Vertical Forms’. The iconic sculpture has been sited at the University of Hertfordshire (previously Hatfield Technical College) since its fabrication 70 years ago and was installed as part of the fabric of the building without any structural records of installation remaining. Therefore, for the de-installation and removal of the work, we had to organise and carry out a structural survey of the sculpture and the building in order to plan its removal and any subsequent restoration of both elements which may be required. 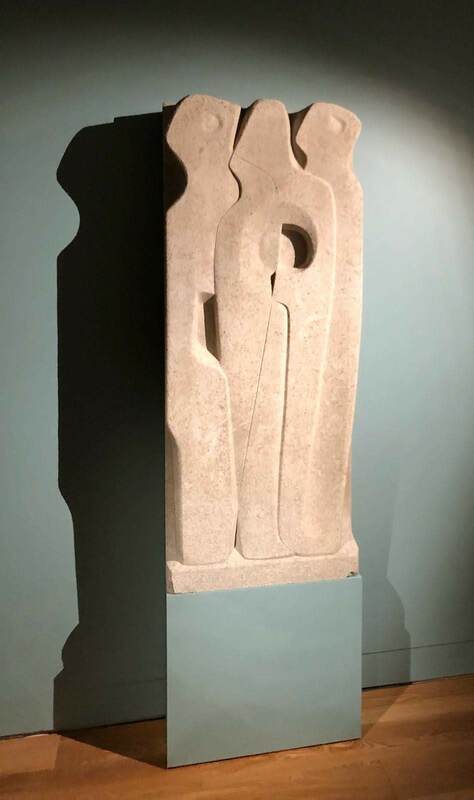 Once the work had been safely removed we liaised closely with Patina Fine Art to restore elements of the work which were disrupted by the deinstallation and began the challenging task of transporting and installing the work at the newly opened St Albans Museum and Art Gallery. Without being able to accurately appraise the work in situ at its original site, the installation and movement of the work required sagacious and perceptive thinking from the team. 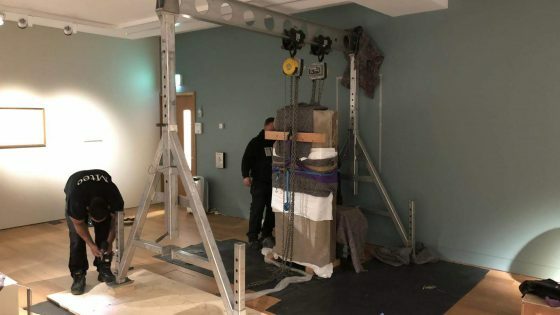 At 852kg the sculpture proved to be too heavy for the museums goods lift, and therefore had to be manoeuvred into the basement gallery space using a series of manual handling and hoisting techniques. 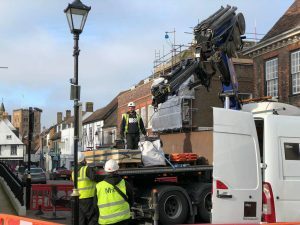 The piece also had to be transferred onto a specially fabricated reinforced plinth made by our Fabrication team, where it will remain for the next 6 months. In summary, working on the exhibition encompassed all of the elements we love as a company, including the challenges presented by the unknown when working with sculpture and collaborating with artists, institutions and contractors with whom there is an historic rapport and narrative. For Project Manager, Dee Williams, there was an added poignancy to the project since ‘Vertical Forms’ was situated on the building in which he studied. Therefore, handling and transporting a piece with such a personal and iconic connotation had a certain resonance, making this job a particularly special one for the team. To learn more about the exhibition or to plan your visit before it closes on Sept, 8 please visit the University of Hertfordshire website.